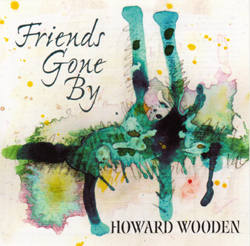 Howard Wooden "Friends Gone By"
Gadfly Records is proud to announce the release of Friends Gone By, from singer/songwriter and multi-instrumentalist Howard Wooden. The long-time member of the popular group Woods Tea Company pulls out all the stops on this solo venture, exhibiting wit and insight in his compositions and sophistication and musicianship in his delivery. By any standard, it is an impressive outing. Wooden, who sings and plays a variety of instruments for Woods Tea Company, steps out front for this disc of smart and well-crafted originals. High-end production brings out the best in these songs and instrumentals. Along for the ride are his Woods Tea compadres as well as producer/instrumentalist Pete Sutherland, multi-percussionist Patrick Fitzsimmons, keyboard whiz Chuck Eller, sax maestro Dave Grippo, and folk diva Diane Ziegler. But the glue that holds the project together is the group of songs Wooden brings to life. From musings on where he is in his 50-year-old life to enchanting wordless melodies to "road songs" this CD brings Wooden's personality along for the ride -- and you'll enjoy meeting him. Howard has been playing music professionally for decades now. Growing up in Maryland and Michigan, his family settled in Vermont in his adulthood, where he stayed and played music in a variety of configurations. He joined Woods Tea Company in the mid-'90s, and the group has maintained its schedule of 100+ shows per year since that time.